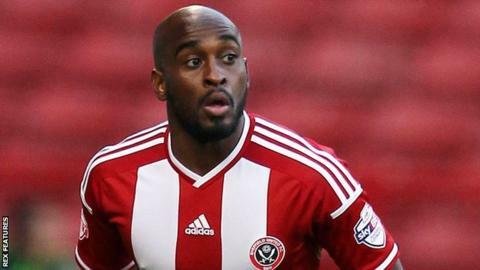 Debutant Jamal Campbell-Ryce rescued a point for Chesterfield with his first touch of the game against Scunthorpe. Paddy Madden latched on to Jim O'Brien's through ball to put the hosts ahead with his 20th goal of the season. Chesterfield could have levelled before the break when goalkeeper Luke Daniels tipped Connor Dimaio's shot over. But Campbell-Ryce, who joined the club on loan from Sheffield United prior to kick-off, salvaged a draw for the visitors from Jay O'Shea's cross. Scunthorpe manager Nick Daws told BBC Radio Humberside: "Today we haven't created enough chances and we've not forced Tommy Lee to make enough saves. I thought we opened them up and showed what a good side we can be. "We lacked a little bit of energy and that's not been up recently and I thought we looked a little bit lethargic and a little bit stretched. "We turned the ball over too many times and that gave Chesterfield opportunities." Match ends, Scunthorpe United 1, Chesterfield 1. Second Half ends, Scunthorpe United 1, Chesterfield 1. Attempt saved. Kyle Wootton (Scunthorpe United) right footed shot from the centre of the box is saved in the centre of the goal. Corner, Chesterfield. Conceded by David Mirfin. Attempt saved. Jay O'Shea (Chesterfield) right footed shot from outside the box is saved in the centre of the goal. Attempt missed. Gary McSheffrey (Scunthorpe United) right footed shot from outside the box is too high. Substitution, Chesterfield. Drew Talbot replaces Oliver Banks. Hand ball by Luke Williams (Scunthorpe United). Attempt blocked. Lee Novak (Chesterfield) right footed shot from outside the box is blocked. Jim O'Brien (Scunthorpe United) is shown the yellow card for a bad foul. Foul by Jim O'Brien (Scunthorpe United). Oliver Banks (Chesterfield) wins a free kick in the attacking half. Substitution, Scunthorpe United. Gary McSheffrey replaces Jamie Ness. Luke Williams (Scunthorpe United) wins a free kick in the attacking half. Foul by Jamal Campbell-Ryce (Chesterfield). Attempt missed. Luke Williams (Scunthorpe United) right footed shot from outside the box is close, but misses to the left. Hand ball by Kyle Wootton (Scunthorpe United). Attempt missed. Jim O'Brien (Scunthorpe United) right footed shot from outside the box is high and wide to the right. Substitution, Scunthorpe United. Luke Williams replaces Neal Bishop. Liam O'Neil (Chesterfield) wins a free kick on the left wing. Paddy Madden (Scunthorpe United) wins a free kick in the attacking half. Foul by Conor Townsend (Scunthorpe United). Corner, Chesterfield. Conceded by Jordan Clarke. Corner, Chesterfield. Conceded by Conor Townsend. Goal! Scunthorpe United 1, Chesterfield 1. Jamal Campbell-Ryce (Chesterfield) right footed shot from the centre of the box to the high centre of the goal. Assisted by Jay O'Shea with a cross. Substitution, Chesterfield. Jamal Campbell-Ryce replaces Connor Dimaio. Corner, Chesterfield. Conceded by Murray Wallace. Attempt missed. Jay O'Shea (Chesterfield) left footed shot from outside the box misses to the right. Liam O'Neil (Chesterfield) is shown the yellow card for a bad foul.